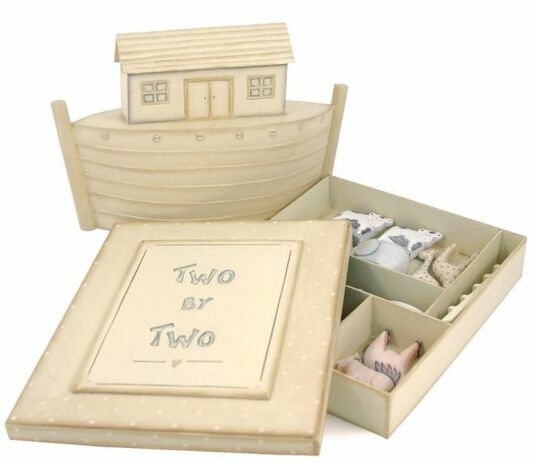 An East of India 30-piece hand-carved gift set. 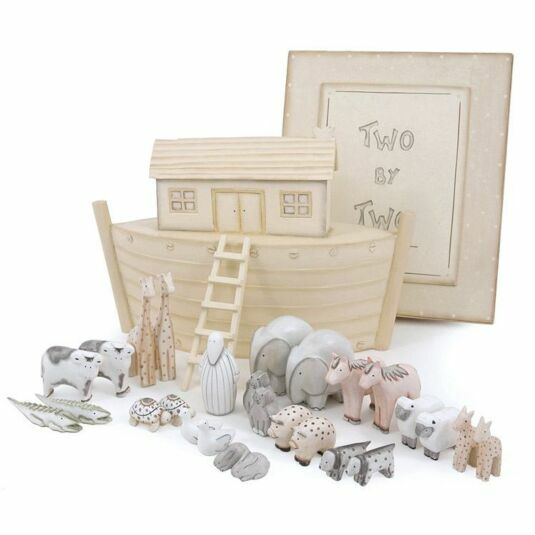 This superbly crafted set consists of two pieces; an Ark that looks like a children’s illustration brought to life and a wooden box containing the carved animals that go with it. 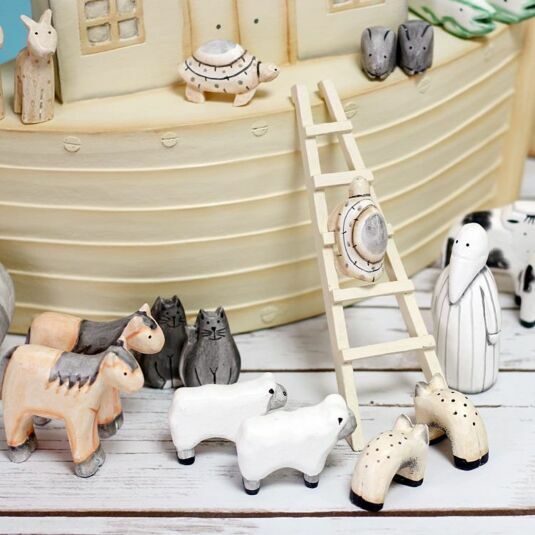 The Ark is painted in mellow cream with ochre accents. 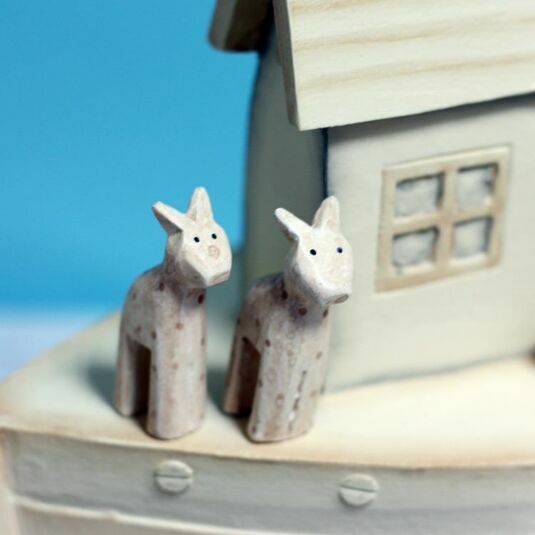 It has a deep, curved hull, on top of which sits a little house for a cabin, with carved doors and windows and a steeply pitched roof. 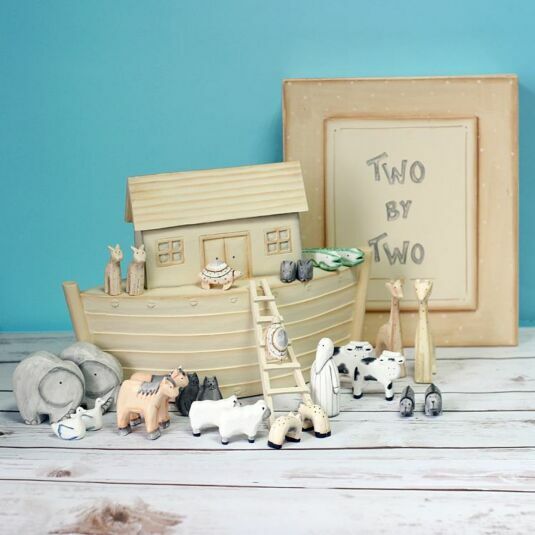 The wooden box which accompanies the ark is painted in matching soft tones of cream and ochre, the lid fits snugly and has a pattern of pale polka dots and a cream-painted plaque, which is carved with the words Two by Two and a tiny heart. The lid lifts off to reveal a partitioned interior, with shredded brown paper to emulate the straw which the animals are using for bedding. 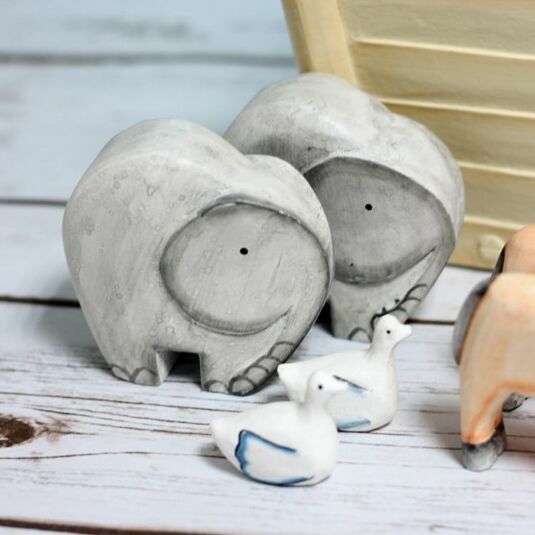 There are elephants, giraffes, cows, leopards, geese, pigs, cats and crocodiles, turtles, sheep and horses, all nestled together and all carved and painted in an endearing naïve style with soft colours and simple contours. 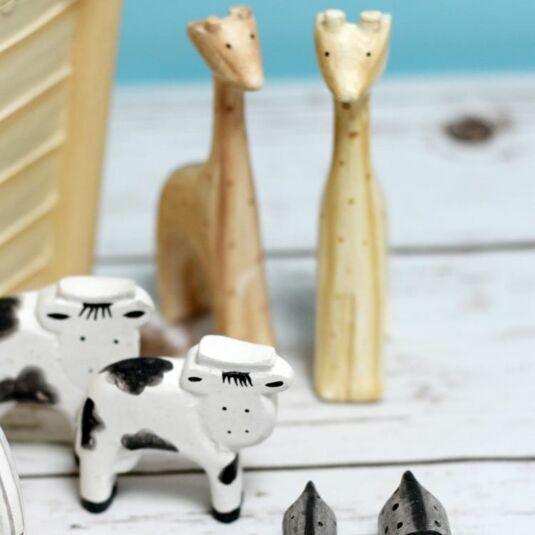 Noah himself is carved with the simplicity of a Nordic sculpture, with a pointed beard and a hint of indentation suggesting a moustache, above which two dots for eyes give him a slightly bemused expression. The final piece is a primitive A-frame ladder, by which the animal passengers enter the Ark, Two by Two. 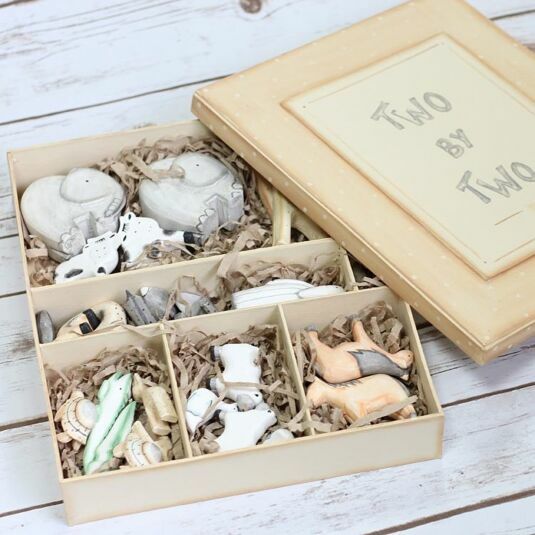 This set would be a wonderful christening or naming gift, but it should be played with under supervision as it is a piece of craftwork with some small pieces and not intended as a toy. Almost every culture has a flood myth, from the Mesopotamian epic of Gilgamesh through Hindu mythology which is very similar to the Biblical Genesis, and Bergelmir of Norse folklore. It seems likely that these myths arose due to real cataclysmic events following rises in sea level after the last Ice Age or Tsunamis resulting from meteor strikes and high levels of rainfall because of climate change. 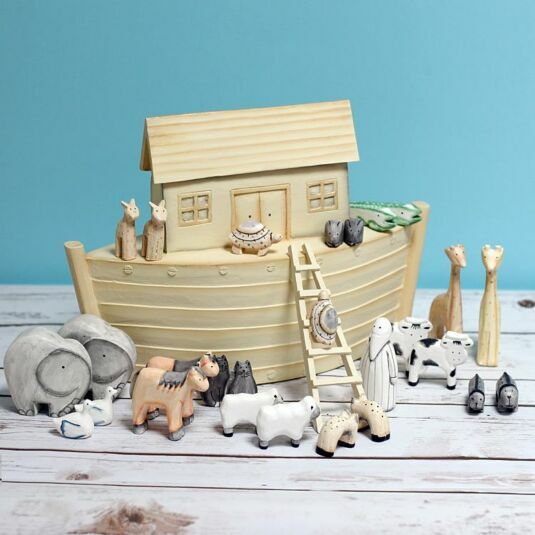 Whatever their origin, the ingenuity and tenacity of mankind in surviving these events is commemorated by the inspirational story of Noah’s Ark, which is frequently retold to this day, not only in a religious context but also in popular culture via film and TV.